In my previous mono-garden existence I enjoyed growing the unusual species, the less common cultivars, the few and far between. Any plant I hadn’t come across before was irresistible to me, I actively sought out the rare, the hard to come by. If a visiting dignitary either enquired after a cultivar, genus or even species name or asked for a cutting/seed pod, I puffed up with pride. These exotics elbowed the commonplace in the corners and, I blush to say, often had preferential treatment. Now I am working in several new gardens with clients who knowledge ranges from “haven’t a bloomin’ clue” to “clever clogs” and I am consequently receiving some serious life lessons. I am beginning to once again appreciate the “ordinary” and feel slightly embarrassed about my previous dismissal of the standard stalwarts that grace many gardens. My eyes have been refreshed and I am looking at these old favourites anew. 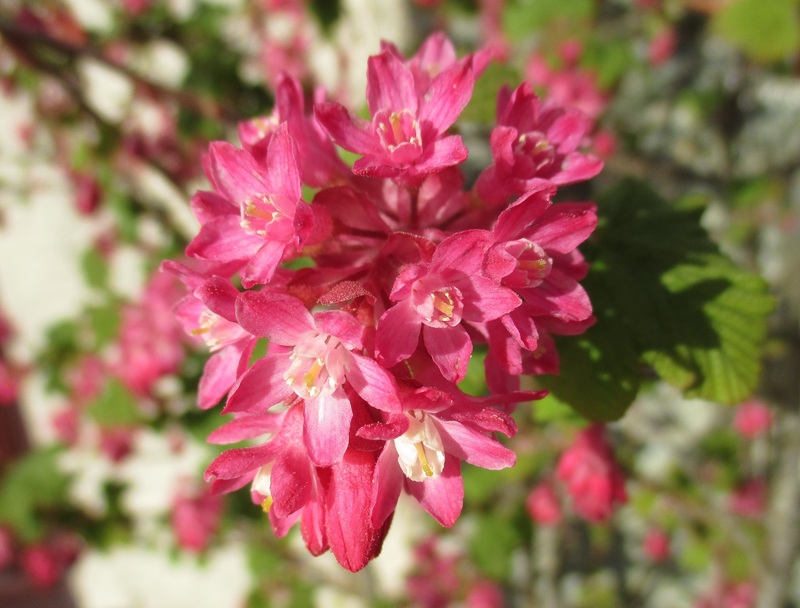 This flowering currant, Ribes sanguineum, stopped me in my tracks yesterday at the farm. The drooping racemes of pink and white looked stunning. This was seconded by a camera-shy bee who wasn’t thinking “how common” but “how yum” as it supped at Bar Currant. Do not fear I am not completely cured, my Lust List is still being added to and I am not adverse to slipping one of my weird and wonderful friends into these new gardens. I am still not convinced by forsythia though, I will keep trying but don’t get your hopes up! Forsythia intermedia really shouts spring is here – I can’t cope with the viridissima! I think I may have had a bad experience with it in a former life! It’s funny how these likes and dislikes come and go. I was very enthusiastic about Forsythia for awhile, probably one spring after a particularly long and grueling winter. My daughter used to dislike all yellow flowers, but now she’s planting daffodils like everyone else does. I guess it’s just part of the gardener’s journey. I think you are quite right, and what is rare to some is common to others. Like your wonderful natives plants that to me are exotic beauties!